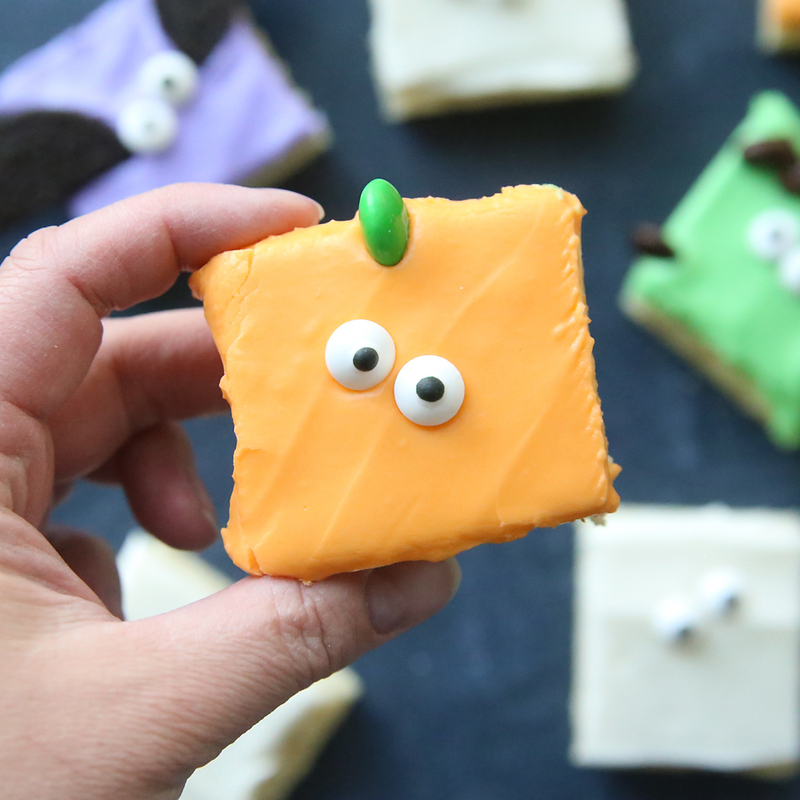 Halloween sugar cookie bars are so easy to make and way faster than rolling and cutting sugar cookies! They’re easy to decorate, too. You’ve seen those sugar cookie decorating videos online, right? The absolutely mesmerizing ones you can’t look away from? While I admire the artistry involved, I have one overwhelming response to those cookies: ain’t nobody got time for that! In fact, I’ve been avoiding making sugar cookies lately because even though they taste amazing, they take a long time! All that rolling and cutting and baking sheet after sheet of cookies…honestly it’s hard for me to devote an entire afternoon to a dessert that doesn’t even involve chocolate. Last week I decided to try something new (for me, at least). 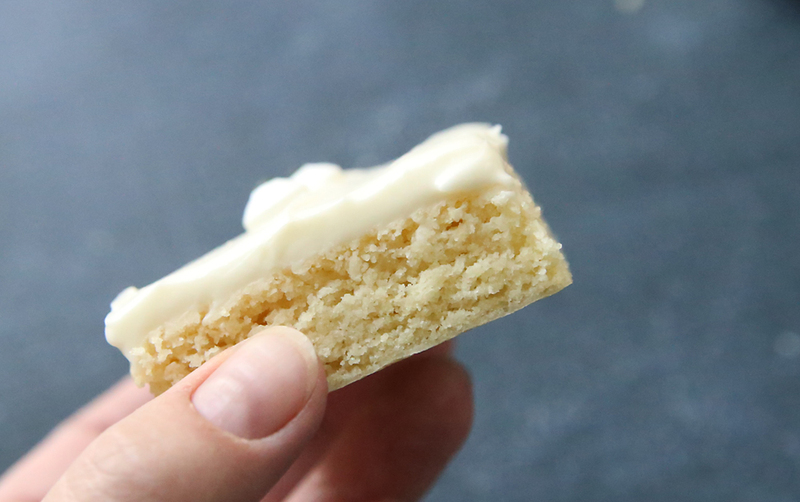 I made my mom’s famous sugar cookie recipe into sugar cookie bars, and they turned out great! Mix, bake, and frost, and about an hour later I had 48 sugar cookie bars just waiting to be shared with friends. 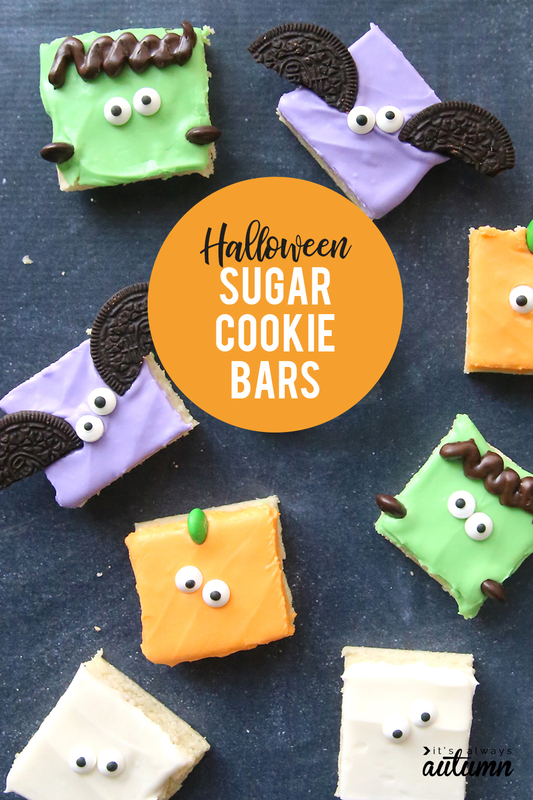 I even added a few extras to turn them into Halloween sugar cookie bars. 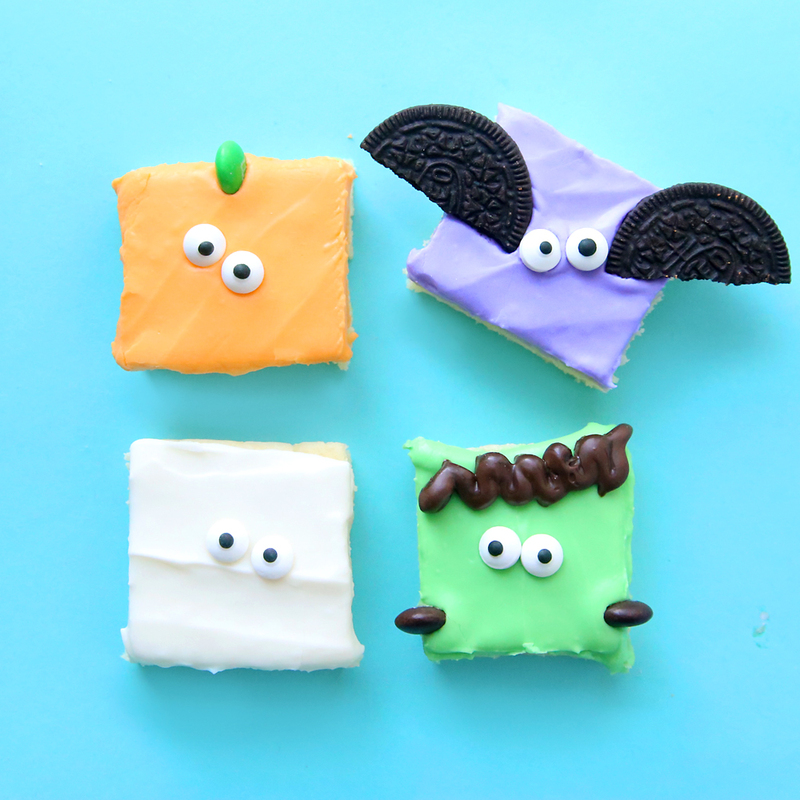 For even more Halloween cookies, find 33 of the easiest Halloween cookie recipes right here! 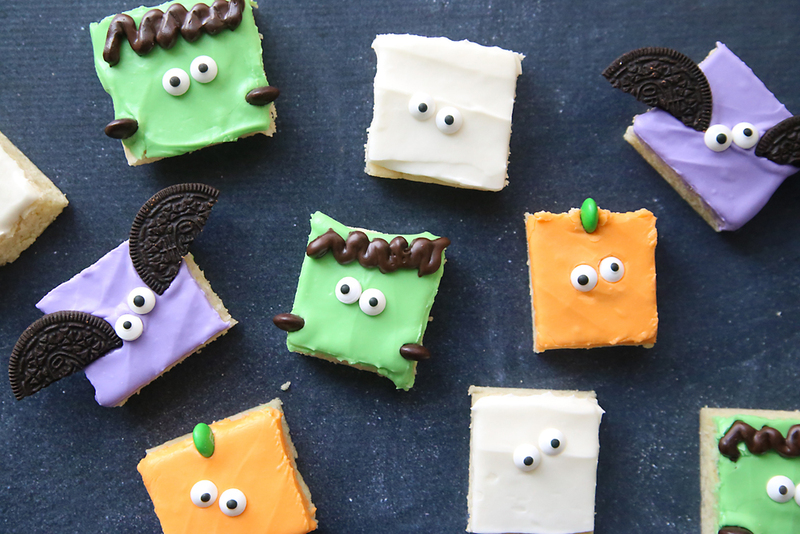 And find 20 easy Halloween treats here. Making these was so fast! I mixed up the dough and pressed it into an 11×17 inch cookie sheet with high sides (also known as a jelly roll pan). Twenty five minutes later it was cooked through – no need to refrigerate the dough or worry about rolling it to the right thickness or anything! I sliced the cookie bar into quarters before frosting with four different colors. Each color got cut into 12 bars for 48 total bars. 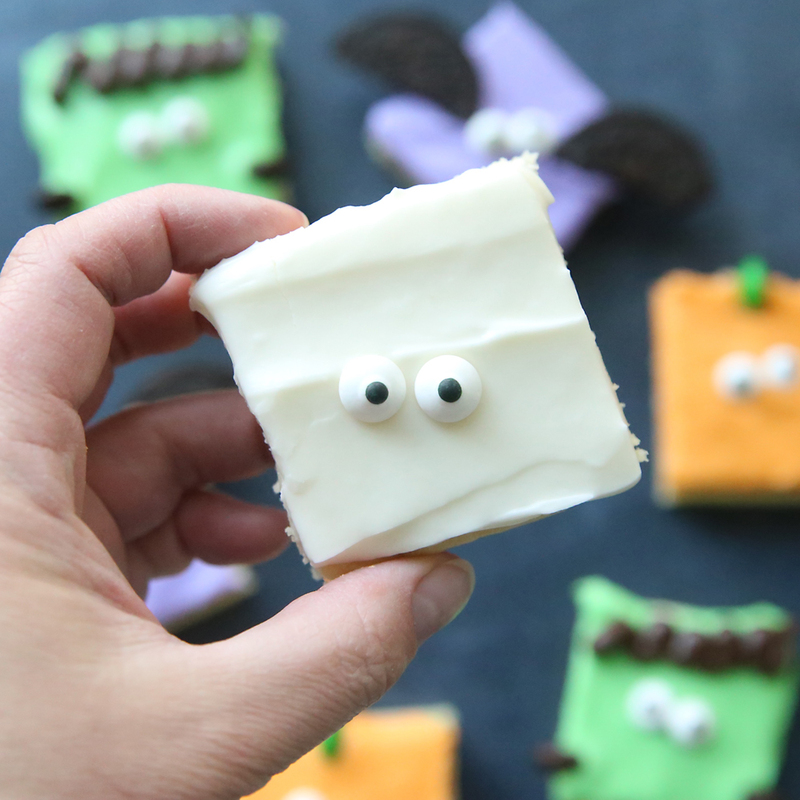 Sugar cookie ghosts: just white frosting and a couple of candy eyes. Sugar cookie pumpkins: orange frosting, green m&m, candy eyes. 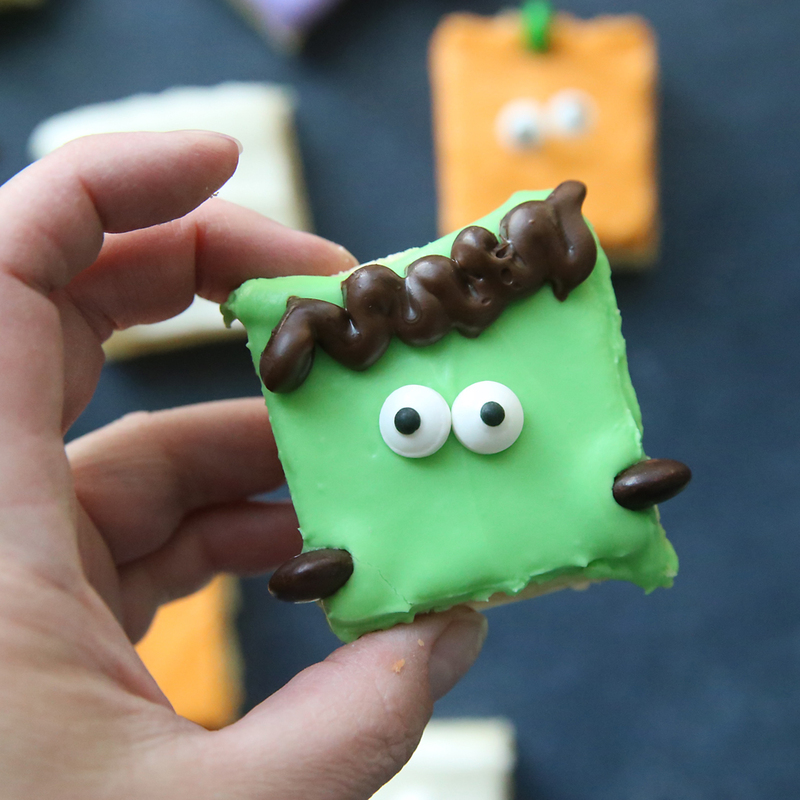 Sugar cookie Frankenstein: green frosting, melted chocolate chips piped for hair, candy eyes, and brown m&m bolts. 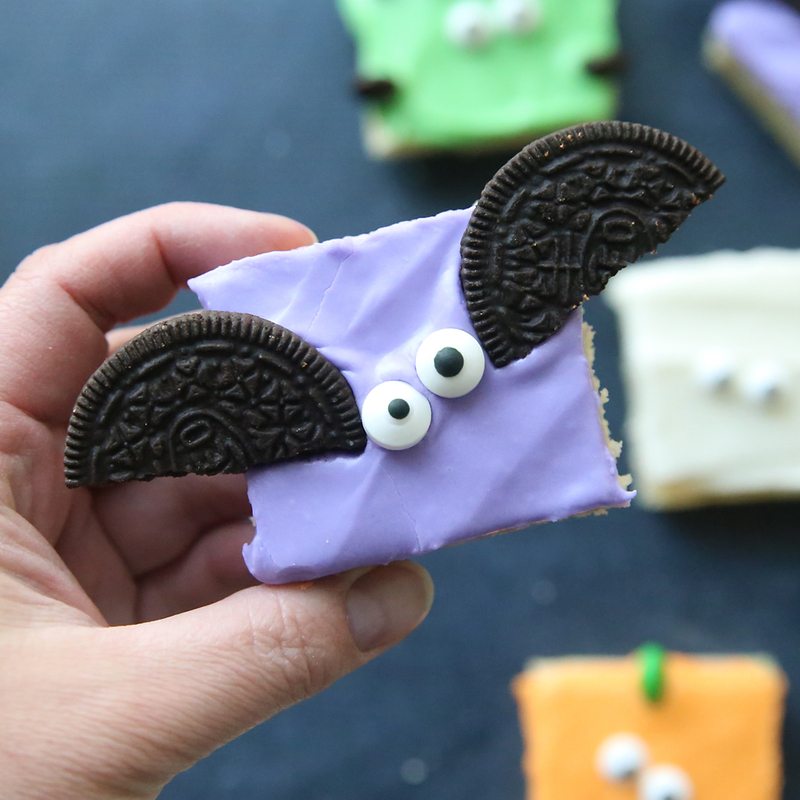 Sugar cookie bats: purple frosting, candy eyes, and an Oreo, split and sliced in half for wings. 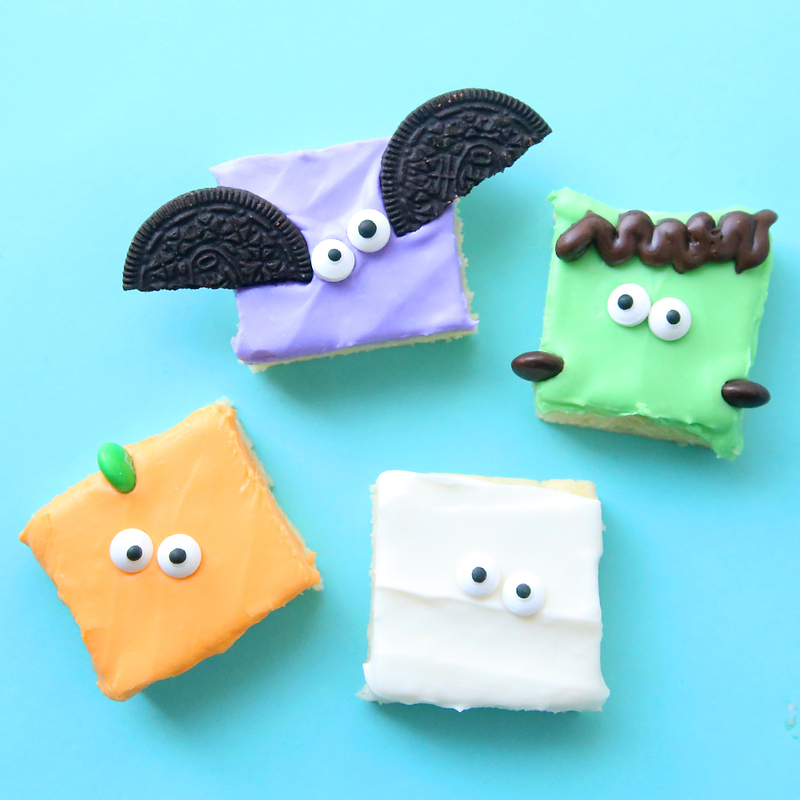 These would look pretty cute out on a tray for a Halloween party! 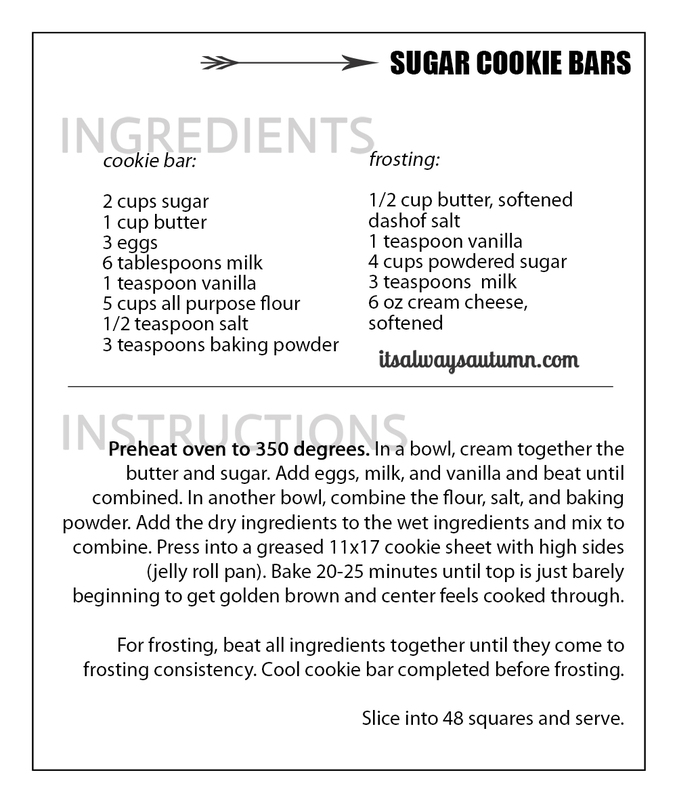 You can download the free printable recipe card by clicking here. Note: Once you have sliced and decorated the cookie bars, you will want to keep them in a covered container so the edges don’t dry out too much. If you have lids for your large cookie sheets you can spread the bars out between two cookies sheets and put a lid on to keep them fresh. Where can I find those eyes? They are so cute but I have never seen those eyes before. I found them in the baking section at my local King Soopers (Kroger). They were by the sprinkles, squeeze frostings, etc.